This article first appeared in The Edge Malaysia Weekly, on November 7 - 13, 2016. ONE of the ironies of life is that those who most need funding often find it the hardest to get it. Micro-enterprises and small and medium enterprises (SMEs) know this feeling the best. Typically, when a small or early-stage SME goes to the bank for a loan —be it a term loan or a short-term funding option for working capital — the banks want to see some form of collateral or a substantial track record. Companies that cannot show collaterals or a long-enough track record of being in business will typically be shown the door. So, what do they do? Some business owners have to tap their personal savings or borrow from friends or family. Some may even have to take out a personal loan or something from the shadow borrowing industry. This gap is indeed a problem that has been said to inhibit the growth of SMEs in the country. Securities Commission chairman Tan Sri Ranjit Ajit Singh notes that Malaysian SMEs face a financing gap of a staggering RM80 billion. This is based on the SC’s internal research and analysis which found that SMEs and micro-enterprises as a whole would need that amount of financing, but found it difficult, if not impossible, to get loans from conventional banks. “We believe that market-based financing, including equity crowdfunding and peer-to-peer (P2P) lending, may provide alternative solutions to address the financing needs of our SMEs,” Ranjit said in his sppech at the SCxSC Digital Finance Conference in Kuala Lumpur, last Thursday. P2P lending has landed in Malaysia with the SC last Thursday announcing the registration of six approved platform operators. The operators have nine months to operationalise their platforms so that businesses can seek a listing for P2P borrowings whilst investors — retail and sophisticated — can participate in this new investment class. Essentially, anyone can lend money to a business or a company that has been assessed and accepted by a P2P platform operator. This comes a year after the SC issued licences for six equity crowdfunding (ECF) platforms to operate in Malaysia, making the country the first in Asean to enable this form of digital finance. Already, equity crowdfunding has raised a total of RM8 million in 11 successful campaigns over the past six months via registered operators. There has been strong interest in both technology and non-technology companies across a wide range of sectors that are interested in equity crowdfunding. According to Ranjit, P2P as an alternative form of financing is equally promising given that over US$25 billion was raised on P2P platforms globally in 2015.That total is projected to grow to about US$96 billion by 2025, Ranjit added. At this point, the new P2P operators have the dual task of balancing between finding the right mix of issuers (businesses and companies in need of funding) and investors willing to loan them money. As Funding Societies Malaysia chief operating officer Wong Kah Meng puts it, it is a chicken and egg situation. “If you do not get good issuers, investors will go away. But if you cannot bring in enough investors, then issuers may not want to come in. They are both very important and I don’t think both are easy,” says Wong. The common sales pitch for P2P lending is that the financing rates listed on P2P lending platforms are much more attractive than current fixed-deposit rates which are at between 2% and 4%, depending on the banks and client relationship. The six P2P operators are all targeting slightly different classes of investors and borrowers. For example, Ethis Kapital, which intends to operate a P2P lending platform for shariah-compliant businesses, is aiming at Muslim and non-Muslim investors who want to invest in the growth potential of the halal market. Peoplender, operated by financial technology startup P2P Ventures Sdn Bhd, meanwhile, is setting its sights on younger investors by offering investment notes from as low as RM50 for a single investment note. “It’s both financial inclusion for SMEs and wealth-creation for the people,” says P2P Ventures chief operating officer Kristine Ng. On the other hand, B2B FinPAL’s target investor group are the high-net worth individuals so that it can maintain enough liquidity for small businesses to borrow. “There is definitely a demand for money. So, what we have to ensure is to get enough support to meet that demand,” says TS Lee, the CEO of B2B Commerce (M) Sdn Bhd, which operates B2B FinPAL. Two of the operators — B2B FinPAL and ManagePay Services — have some links to the SME sector given that their parent companies are B2B service providers. ManagePay Services — a subsidiary of the ACE-listed ManagePay Systems Bhd — has been in the business of providing payments solutions to companies large and small. It hopes to leverage its existing technological know-how and networks to give its P2P platform a head-start. B2B FinPAL’s parent, B2B Commerce (M), has for the last 17 years provided supply chain management software solutions in the SME space. Its customer base includes companies in retail, fast-moving consumer goods, oil and gas, manufacturing and logistics around the region. B2B FinPAL aims to provide P2P financing for SME’s micro-invoice factoring and business expansion financing. It already has a pool of about 5,000 businesses that use its system daily that it could potentially tap as issuers on its platform. “SMEs suffer from cash flow issues. We find that most of them cannot fulfil at least 50% of purchase orders that come in because of cash flow [problems] so there is a loss in profits. The banks don’t provide it because the amounts are very small, a few thousand ringgit,” says Lee. Funding Societies’ Wong says the platform will target businesses in core sectors of the Malaysian economy, particularly those in manufacturing, wholesale and retail, food and beverage and accommodation. Funding Societies, which operates in Indonesia and Singapore, offers business term loans and invoice financing, so that SMEs can tap into any collateral that they may have, including invoices which are essentially promises by clients to pay an agreed amount for goods or services received over a period of time. Funding Societies, Wong says, takes a formulaic approach to assessing the creditworthiness of businesses and companies. They look at both financial and non-financial information, including behavioural information and the key people behind the business. “We are more flexible than a bank. A bank will say ‘Okay, this is the score card, if a company passes, then it passes.’ That is a one-size-fits-all approach,” says Wong. What, then, in the event of a default? Wong says that Funding Societies handles late or missed payments internally by trying to work with the borrower to reschedule or restructure the loan as best as it can. “You have to bear in mind this is the risk borne by investors; we are here to facilitate the process. We will see what works for the SMEs. We don’t want to say, ‘We are cutting you off, pay back the loan now’. That kills off the relationship and it’s not fair debt collection practices,” says Wong. According to the Funding Societies website, the default rate stands at under 4% to 5% of total borrowings on its platform. Most P2P platforms also register default rates of low single-digit percentages. The emergence of P2P lending in Malaysia raises the question of how this will impact conventional banks. Much has been made about the potentially disruptive impact of financial technologies on banks and the status quo of the financial services industry. In the immediate term, tech industry people and banking analysts say there are no direct impacts on the banks’ existing business. After all, these micro-enterprises and SMEs are generally not bank customers. Some, however, wonder if P2P lending could somewhat affect the banks’ CASA (current account and savings account deposits), which is a cheap source of funds for banks. 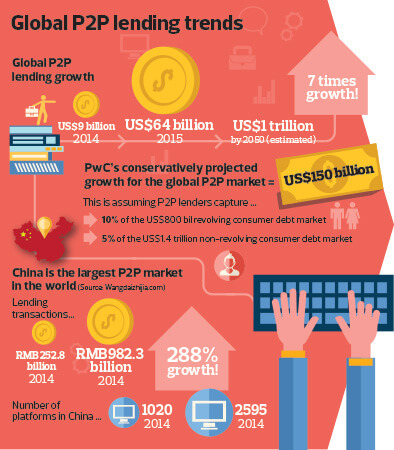 “But this is only if P2P lending grows substantially over the next three to five years, with more and more retail investors considering this as a viable asset class to park their money,” says a banking source. There are also those who do not believe that marketplace lenders would pose a significant threat to banks in the mass market. Life.SREDA’s Money of the Future 2016 report notes that P2P lending still only amounts of 0.08% of the US$98 trillion in global corporate and household debt. Nevertheless, there has been intense interest in obtaining a P2P operator’s licence in Malaysia. Those eyeing it see it as akin to a banking licence, leveraging on technology and the openness of regulators in embracing new forms of finance. SC executive director Chin Wei Min disclosed at a press conference that the commission had received over 50 applications from those keen to be a P2P platform operator. According to Chin, the applications process also saw some financial institutions participating via partnerships and joint ventures. But based on the six approved, it is clear that local banks did not apply directly to be an operator. Local banks are certainly not staying on the sidelines. It is learnt that at least two of the six approved operators are finalising partnerships with domestic banks. Sources say that RHB Bank Bhd is among the local banks that will tie up with one of the approved P2P operators. The most obvious route for banks is to partner with P2P operators and use them as an incubator of sorts. An SME that cannot get past banking requirements may be funnelled to a P2P operator. When the SME grows to a certain size or establishes an adequate track record, it can then be funnelled back to the bank. For example, Funding Societies works with DBS Bank in Singapore and Sinarmas Bank in Indonesia. Funding Societies Malaysia’s Wong says that they are in talks with a few banks and will soon announce a partnership.